At Matt Snowball Music, we keep all the gear you need to run power around your stage or event with our power distro/distribution equipment. Whether your tour is in London, UK, Europe or Worldwide – we can meet your needs. Our custom transformers are designed to make your life easy on the road. We build units in our London workshop using transformers wound to our specification. There’s a voltmeter on the output, and three settings to make sure you can adjust the voltage to suit your exact location. The transformers are housed in a strong flight case for easy transport and portability, and are rated at 2KW. These transformers are non-isolating, and have been designed for stage use. We always keep several in stock. Our stock includes a wide range of ready-made Ceeform cables in a variety of lengths to suit your backline set up. 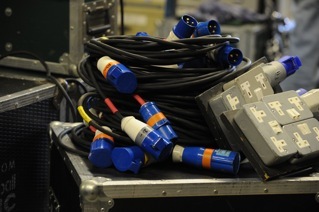 This includes 32 and 16 Amp cables, Ceeform splitters and Ceeform to 13A boards. We keep a range of mains distribution units for hire with single phase inputs up to 63A. The units feature multiple Ceeform outlets, which are RCD and MCB protected. Digital voltage and current displays are available. All equipment we rent out is kept in top condition by an experienced in-house team. We regularly service all stock and individually test each item before your hire. That way you can be confident it’s in perfect condition before you take to the stage.